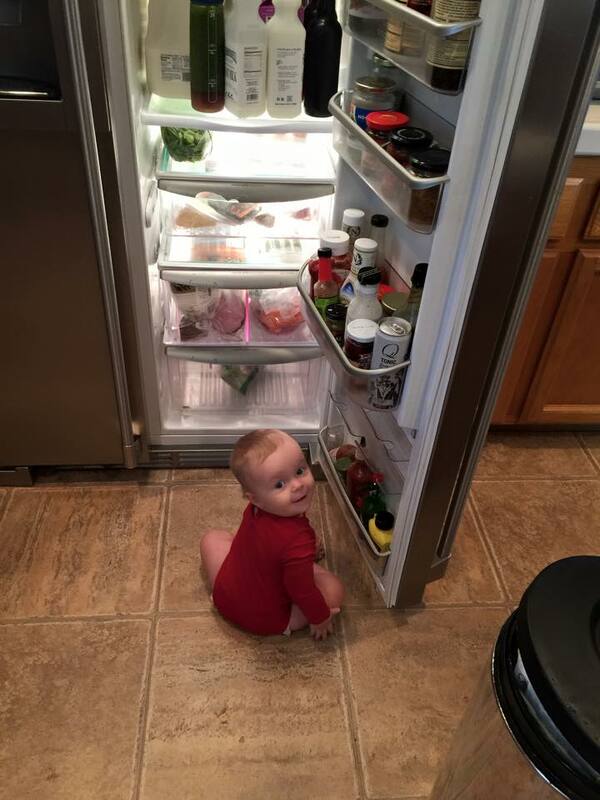 Uh oh… Came back to the kitchen and Bridget was rifling through the fridge. Again. Hungriest baby ever. Wow, does that kid love to eat. Okay… I may have made that last part up, but it’s tough to adequately capture this one-year-old’s ferocity whenever she’s hungry. The look in her eyes alone tells me she would definitely be threatening to burn the house down if she had enough mastery of the English language to do so. Every time I turn my back, Bridget the Power-Eater beelines straight to the fridge, busts right past the child-lock without breaking step, and starts rifling through the drawers. I have to drag her away, screaming, as shredded cheese falls out of her mouth and her little hands flail around, trying to grab a cup of yogurt on her way out. I know what you’re thinking: if that kid is so hungry, she must not be getting enough to eat. But folks, you have no idea what an angry, bottomless pit this child’s appetite truly is. I literally clean out our cabinets by piling food on Bridget’s tray, trying to find out how much it would take to finally leave her FULL. She easily eats three times as much as her big sister, who is no slouch herself. Brontë can pop that fridge lock right open and empty the cheese drawer in about 30 seconds, easy. She was probably the one who showed Bridget how to do it. I find cheese all over the house, all the time. My daughters are obsessed with the stuff. They are not only obsessed, but are turning into little cheese snobs. While I was upstairs, last week, Brontë dug into the fridge and ate half a block of aged Parmesan. We keep buying string cheese sticks for the girls to snack on, but they usually turn them down in favor of aged gouda, mizithra, and feta. They’ll only eat mild, inoffensive mozzarella in a pinch. I find myself torn between being proud of their good taste and getting tired of all the good cheese disappearing. I may have to start hiding it. I found grated cheese in my bed when I went to sleep last night and today I found a half-eaten block of smoked mozzarella, some gnawed-on Gouda, and an empty bag of grated sharp cheddar. Apparently, Brontë has been on a cheese binger and was attempting to hide the evidence. At least Brontë’s binging is mainly cheese-centric. Bridget’s intake, on the other hand, is so astonishing that I finally asked the pediatrician if she was alright. He reassured me that she looks perfectly healthy, just unusually strong and hungry. She’s also quite tall for her age. Until she realized all the food was gone. We’d been spooning more and more onto her plate as she polished it off, thinking “surely she won’t eat an entire adult portion,” until I finally had to start dipping into mine. Once Bridget realized no more food was forthcoming, she started to wail and scream. We wiped her off and set her down, where she began rolling and kicking and flailing in a mad baby rage. Infuriated that her protests didn’t result in more pasta, she stood up and stomped across the room. Grabbing a heavy end table with a marble top, she flipped it over like it was nothing and started laughing, apparently having worked off her Cheese Anger. I had a future flash of her with a couple of blonde braids and furry boots, swinging a two-handed ax as she screams. I’m a little scared, I’ll admit. That table was HEAVY. I think your sweet, cheese-loving child might be the baby version of me. But stuffing handfuls of spaghetti in her mouth looks way cuter on her than it does on me. Ha, yes they can get away with so many things we can’t, right?